86/92 size is currently out of stock. 110/116 size is currently out of stock. 122/128 size is currently out of stock. 134/140 size is currently out of stock. 146/152 size is currently out of stock. 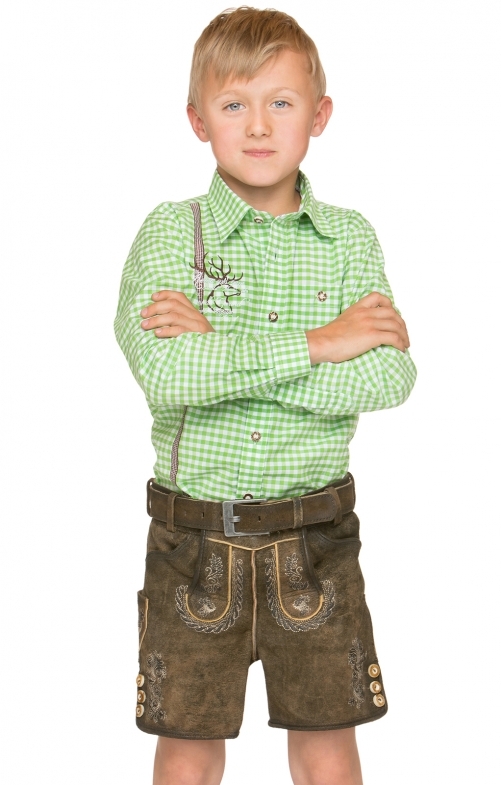 Moritz children's leather short trousers from Stockerpoint in stone. The leather trousers made of high-quality tanned buckskin leather in deer look is characterised by the extraordinary structuring and harmonizes perfectly with the buttons in stag horn look. The trendy relief embroidery is created by skilled craftsmanship and gives the model its unique character. Thanks to lacing on the back of the waistband, the leather trousers can be adjusted in width. The trousers will be delivered with belt. This model is also available for adults for the perfect partner look. Wunderschöne Lederhose, die nicht jeder hat !! Qualität ist spitze !! Wunderschöne Lederhose - passt und sitz perfekt !! Nur zu empfehlen !!! !